(AUSTIN, TEXAS - Dec. 1, 2017, source: Juice Consulting) - The 53rd annual Austin Trail of Lights is proud to announce its biggest food drive ever and a variety of nonprofit activations. This year, the Trail of Lights Foundation is partnering with the Central Texas Food Bank to challenge all attendees to bring a canned good any public night of the Trail. The organization is asking attendees help raise 25,000 meals, or 30,000 pounds of food to benefit hungry Central Texans. There will be drop-off bins nightly at the Trail of Lights entrance. The Trail of Lights will open to the public Saturday, Dec. 9, and will run through Saturday, Dec. 23. The official preview party will take place on Friday, Dec. 8. Online ticket purchases are available now at www.AustinTrailofLights.org. "With 400,000 attendees, the Austin Trail of Lights offers a perfect opportunity to make an enormous impact on the Central Texas community," said Leah Davies, president, Trail of Lights Foundation board. "With the support of Trail-goers, we can reach our goal to collect 25,000 meals for the Central Texas Food Bank, that's enough food to feed six families for a year! Please help us support our neighbors by bringing a can of food with you to Zilker Park on any night that you attend." "The Trail of Lights is a great example of what we can accomplish as a community when we work together," said Derrick Chubbs, president & CEO of the Central Texas Food Bank. "This exciting, family-friendly event will help fill our shelves during a time of extreme need and help us provide hope to hundreds of our neighbors this holiday season." The Trail of Lights also provides a community platform for nonprofits and community groups to celebrate with their members. Today the Trail of Lights Foundation also announced the organizations that will participate in the 2017 STARS at the Trail program. STARS at the Trail, started in 2013, will host more than 1600 children, families, seniors and others from 19 nonprofit organizations for private experiences at the Austin Trail of Lights this year. Underwritten by a grant from Vista Equity Partners and other generous donors, The Trail of Lights Foundation provides transportation, private tours, hospitality and visits with Santa for participants who might not otherwise have an opportunity to experience the Austin Trail of Lights. "The Trail of Lights Foundation is committed to opening the doors for this event to as many Central Texans as possible," said Davies. "STARS at the Trail allows us to extend the joy of the Trail and the holiday season throughout our community." Participating STARS at the Trail organizations include: African American Youth Harvest, Andy Roddick Foundation, Boys & Girls Clubs of the Austin Area, CASA of Travis County, Children's HOME Initiative with Foundation Communities, Communities In Schools of Central Texas, Council on At-Risk Youth, Creative Action, Down Syndrome Association of Central Texas, Drive A Senior - West Austin Girl Forward, Helping Hand Home for Children, KIPP Austin Public Schools, Mainspring Schools, Mobile Loaves & Fishes, Ronald McDonald House Charities of Central Texas, The Rise School of Austin andThe First Tee of Greater Austin. "The Trail of Lights is Austin's event and we are committed to keeping it accessible for all members of our community," said Davies. "The Trail of Lights is a platform that celebrates the contributions made by community and nonprofit organizations that work year-round to make Austin a great place to live." "The Trail of Lights is an iconic holiday tradition for Austinites, and it's the perfect way to celebrate our students' achievements this year," says Jennifer MacCurrach, Executive Director of The First Tee of Greater Austin. "We're thankful to the Trail of Lights Foundation for allowing us to offer this unique experience to our youth and their families. There are so many deserving nonprofits in Central Texas, and we're honored to be included in the STARS at the Trail program this year." "STARS at the Trail brings unforgettable laughter and memories for our children," notes Danita Hurtado, parent of STARS participant with Creative Action. "For parents, especially those who may have hardships, providing such gifts to their children, it's an outstanding opportunity." STARS at the Trail is underwritten by Vista Equity Partners and supported by donations from Almanza, Blackburn, Dickie, LLP, Higginbotham, Mario Espinoza and Mark Williams, ABD Law Firm, Carolyn and John Willingham, Eightfold, Katrine and Bill Formy and Team Taylor. Additionally on Tuesday, Dec. 12 the Trail of Lights will present the Annual HEROES Night, presented by the Texas Lottery, an evening that will honor first responders- police, fire and EMS, active military, veterans, emergency responders and natural disaster relief workers. Guests will create holiday letters to send to troops and other activities to pay tribute to first responders' service. Heroes are invited to complimentary red carpet treatment on Dec. 12. On Thursday, Dec. 14 the Trail will host its first ever Cap City Music Nighthonoring and highlighting some of Austin's most prominent music nonprofits and their supporters. Participating organizations include HAAM, SIMS, Black Fret, Austin Music Foundation, ALL ATX and Swan Songs. The evening will feature performances by Interrobang Brass Band, Mother Falcon and Ephraim Owensand information will be presented by all the participating groups. 2017 will be the sixth year that H-E-B has served as Title Sponsor, H-E-B has also committed to serve as title sponsor through 2019. Additional multi-year sponsors include Vista Equity Partners, Dell Children's/Ascension, Keller Williams Realty, Cirrus Logic, Silicon Labs, T5 Foundation, Robert F. Smith Family, NXP, Maudie's Tex Mex, The University of Texas at Austin, Austin Parks Foundation, ABC Home and Commercial Services, 3M, Central Texas Pediatric Orthopedics, Austin Energy, Longhorn Rents, The UPS Stores, Texas Lottery, Pirkey Barber PLLC, K. Freise & Associates, Maxwell Locke & Ritter, Ambetter Superior HealthPlan, Lori and Tito Beveridge, American Bank of Commerce, and Watkins Insurance Group, NXP USA, Inc., UPS, SHI, Humana. The Trail of Lights welcomes new sponsors including St. David's HealthCare as Fun Run title sponsor as well as Lyft, nLand Surf Park, Solar Winds, Capital One, LCRA, Austin Convention Center, Juice Consulting and Archer-Malmo. The Trail of Lights Foundation is an independent nonprofit corporation dedicated to producing the Austin Trail of Lights as an authentically Austin community celebration. The organization raises the funds from donations by individuals and the business community to produce and ensure the long- term sustainability of Austin's largest community celebration. It is curated in close conjunction with its long-time partners, Forefront Networks and 3Can Events, who provide turn-key production, marketing, sponsorship and programming services to the foundation. 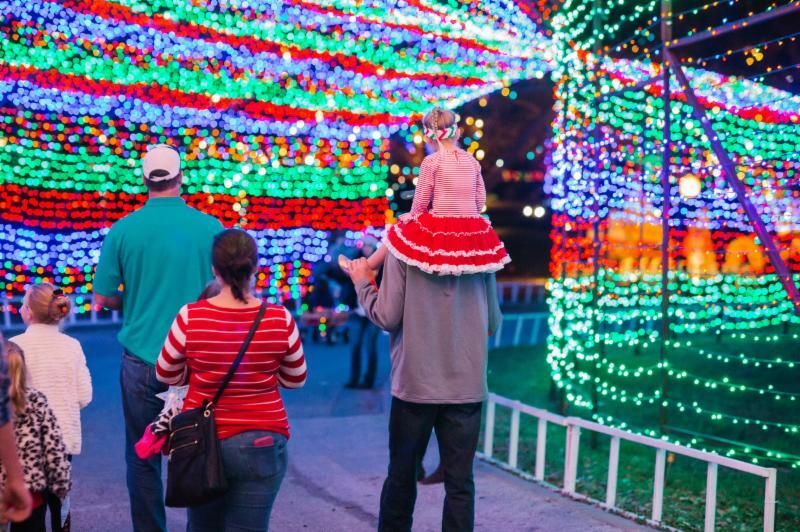 The Trail of Lights has remained in the top three Austin events since the Trail of Lights Foundation adopted the event in 2012.